Click on the photo and see all the photos of Super 8 by Wyndham Amherst NS. Golf course (within 3 km), Mini golf, Snack bar, Vending machine (drinks), Vending machine (snacks), Hot tub, Indoor pool (all year), 24-hour front desk, Newspapers, Safety deposit box, Laundry, Dry cleaning, Daily maid service, Meeting/banquet facilities, Business centre, Fax/photocopying, Gift shop, Mini-market on site, Non-smoking rooms, Facilities for disabled guests, Family rooms, Bridal suite, Lift, Heating, Air conditioning, Designated smoking area. 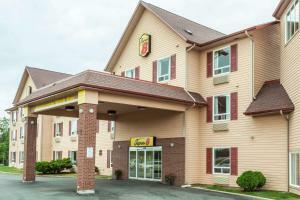 Offering easy access to the Trans Canada Highway and the shopping of Amherst, Nova Scotia, this hotel offers spacious guestrooms with convenient amenities as well as friendly services. Super 8 Amherst provides guests with a free morning breakfast with a daily newspaper. After breakfast, guests can go for a swim in the indoor pool and go down the fun waterslide. After a busy day, guests can relax in a guestroom with amenities such as microwaves, mini-refrigerators and coffeemakers. Guests at the Amherst Super 8 can visit the Anne Murray Museum & Centre. The nearby towns of Parrsboro and Pugwash offer visitors beautiful beaches and scenic trails. The pool will be closed from 18 September 2018 until 20 September 2018. During this period, guests may experience some noise or light disturbances, and the pool will not be available. Guests are required to show a photo identification and credit card upon check-in. Please note that all Special Requests are subject to availability and additional charges may apply.